This 4 roll set of adhesive triage marking tape can be used to identify specific triage areas or equipment on scene of a mass casualty disaster. 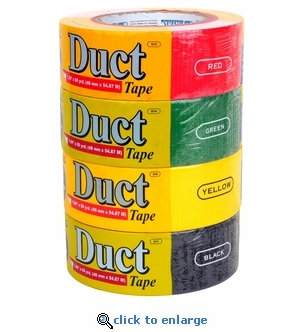 Adhesive triage duct tape will stay in place in all weather conditions. With multiple agencies and responders on scene, triage marking tape will help rescuers guide or bring victims to the correct field medical area for treatment or evacuation. Tears easily - No tools required. Includes one of each color triage tape (Black, Red, Yellow and Green). Brand of Duct Tape May Vary From Image Shown.